This round up is all about the flavor, honey. No explanations or analysis here. You want to read about Blog Appetit's growth and development? We've got that here. Scroll to the bottom to see my favorite of 2009. These recipes are the ones that stand out in my mind and make my mouth water just thinking about them. 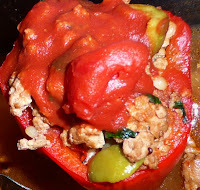 January: These Spanish Stuffed Peppers with Smoked Paprika Tomato Sauce were the first recipe I tweeted. I was all atwitter about the combination of tastes and textures. I couldn't wait to have the leftovers the next day for lunch. While this recipe was made with turkey, I also gave vegetarian options. February: I love gremolata, that raw garlic, parsley and lemon zest topping traditional for osso bucco. Here I use it on top of an earthy root vegetable stew with gremolata. The meal stands out in my mind not just for its taste but because my husband and I shopped the farmer's market for its ingredients and it was our Valentine's Day dinner. March: A new pot inspired a new soup: Sweet and Sour Onion Soup, which combined two of my favorite soup concepts into one. 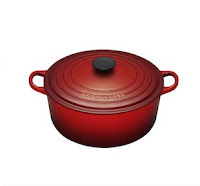 The story behind the pot and the soup began begins with my husband snagging a well-loved, used five-quart red enameled cast iron French (i.e. Dutch) oven at a local estate sale for just $18. April: I wrote a lot about my trip to Buenos Aires. The submarino was a drink I had there. Unbelievably easy, unbelievably good. Take a glass of warm, frothy milk. Submerge a few ounces of good quality chocolate in it. Stir. Drink. 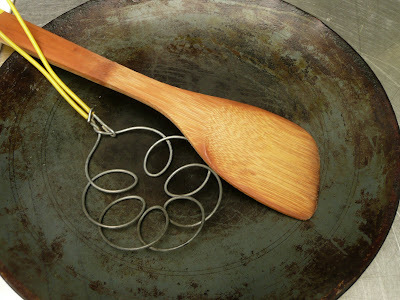 May: Thy of Wandering Spoon taught a class at the Oakland Asian Cultural Center in the famed Vietnamese sizzling crepes called Banh Xeo with loads of fresh seasonal greens and dipping sauce. The results were delicious. I post her recipe here. You can see a slide show of the class here. June: I'm torn between the wonderful Not Your Grandmother's Beet Borscht and Gary's Granola, but I'm going with my husband's granola recipe, it is truly the best. His recipe is constantly evolving. Don't tell him, but I sometimes swipe a handful for a snack. July: I began writing my Jewish food column and kicked it off with some recipes for Israeli-styled grilled food. While the chicken and lamb kabob recipes were great, it was the pomegranate molasses bbq sauce that made me, and several others, swoon. So easy, so delicious, so versatile. August: August was a lazy month. I really didn't write a recipe for this but gave more of a how to, but BBQ Chicken Salad with BBQ vinaigrette was finger licking good, anyway. I also didn't take a photo. 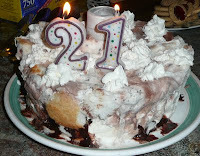 Bad Blog Appetit. September: I probably got more positive feedback from my Cranberried Chicken recipe than any other I've written for the blog or for my Jewish cooking column. It's easy, tasty and very festive. Unfortunately, I don't have the recipe on my blog, you'll have to click the link to it's home on the j. Jewish newsweekly. Luckily, another recipe I wrote that month also pushes my flavor buttons. My Hunger Challenge Cassoulet (which costs about $1-$1.50 a serving) was part of my week's worth of menus for eating on $4 a day or less in support of San Francisco Food Bank's Hunger Challenge. October: This pumpkin pie with dates in filo crust was all treat and no trick this Halloween. November: The hands down favorite from this month is my Balkan-inspired Lemon and Egg Sauce Moussaka. The zing of the citrus, the richness of the lamb, the creaminess of the egg sauce and the earthiness of the eggplant combine to make an unforgettable dish. December: No contest -- from the moment I thought of the concept of a Jewish-Mexican tamale all I wanted to eat was tzimmes tamales. And once you've tried them, I think you'll be similarly obsessed. It's a rich beef and dried fruit stew with a chipolte kick wrapped in a schmaltz (chicken-fat) -based tamale dough. Bring on Christmukkah. 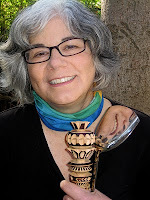 For a recent cooking column in the j. , the Jewish newsweekly of the Bay area, I highlighted how intermarried families also merge their holiday food traditions and wrote about Building Jewish Bridges, a program for Jewish intermarried in the San Francisco area headed by Dawn Kepler. BJB offers a variety of programming and workshops to help couples navigate the differences and compromises in a two-religion household. The site also has a wealth of clear explanations of Jewish holidays and traditions for anyone, intermarried or not, who needs a brush up on Judaism. Dawn was able to give me some examples of families that had successfully merged food traditions and I was enthralled by the idea of a Mexican grandmother making "non-pork" tamales ( a Christmas eve staple) for her Jewish grandchildren for Chanukah. That inspired my tzimmes tamales. Replacing the lard with the chicken fat gave the tamale dough a lot of flavor and helped give the finished tamale a lighter taste. Beef tzimmes (sometimes spelled tsimmes) is a traditional Eastern European stewed dish. Adding the peppers also gives it a bit of a twist as well. To read my full article, click here. Below are the recipes. The chipotle pepper gives the stew a nice tingle without much burn. Remove the seeds if you want the taste without much heat. Tamale making is often a time to have friends or families over to help stuff and wrap the tamales. While extra hands help, the recipe below can be managed by one person without much trouble. 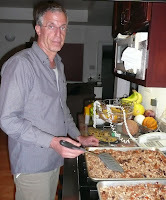 I adapted the tamale-making process from Rick Bayless’ Mexican Kitchen cookbook. Put the corn husks in a large pot. Add water to cover. Bring to boil. Let stand for about an hour, keeping the husks submerged by putting a plate on top of them. Separate out 12 unbroken husks to wrap the tamales in. Tear one of the remaining husks into 12 long ¼” “strings” to tie the tamales. Separate and keep the rest to line the steamer. 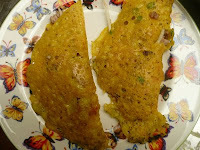 Make the batter by mixing the masa harina and hot water together. Set aside to let cool. 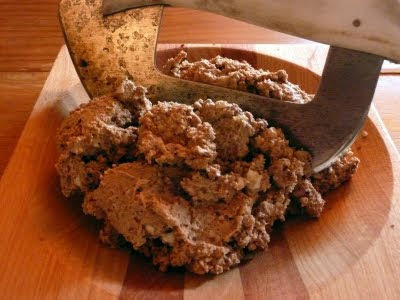 Beat the schmaltz or shortening and baking powder in the bowl with an electric mixer until light and fluffy, about 1 minute. Add the prepared masa mixture in three batches, mixing well with each one. With the mixer going, add in a ½ cup of the chicken broth until combined and then add ¼ cup of chicken broth at a time as needed until the masa mixture is soft but still holds its shape. Mix in the salt, tasting and adding more if necessary. Spread a corn husk open in front of you with the pointed, narrow side at the bottom. Wipe dry with a paper towel. Place ¼ cup of the masa mixture about ¾ of an inch from the top of the husk. Spread it into about a 4” square, being sure to leave a ¾” margin on each side and at least 1 ½ inches from the bottom point. Place 2 Tbs. of the chopped tzimmes filling down the center of the masa. Next pick up the two long sides and push them together, making the batter enclose the meat filling. Roll both flaps in the same direction around the tamale. Flip the stuffed husk so the seam side faces you and fold the pointy end of the husk up to close off the bottom. Secure it by using a torn husk strip to tie it together. Repeat to make remaining tamales. Prepare or improvise a steamer at least 4” deep. Put several inches of water in the pan underneath. Line the steamer with 2/3 of the remaining corn husks. Place tamales inside the steamer with open (top) sides up. They should be packed in so they are standing up. 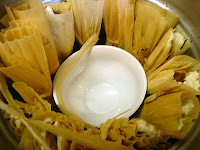 Place a bowl or some crumpled foil to the steamer basket to help the tamales stay upright if needed. Top with remaining corn husks and cover. Bring to and keep water at boiling. Add water as needed and steam for about 1 ¼ hours or until the husk peels away easily. Let tamales firm up for a few minutes before serving with salsa. or maybe Christmas lillies since onions and garlic are in the lilly family. I just wanted to acknowledge some new and relatively new followers. Thanks for choosing to spend time with Blog Appetit! Chanukah Curious -- Read all about how to play dreidel, make latkes and some history on my annual (C)Hanuk(k)ah wrapup here. I've been in the kitchen cooking up beef tzimmes (a veggie and dried fruit-based stew), tzimmes tamales and planning on making a new version of my apple cider vinegar chicken and trying some new recipes including a samosa pie and sweet potato torte. Watch for the various postings. I've also had some things published in the j. and elsewhere I'll post links, to. Just have been busy this time of year. More later plus some Chanukah (Hanukkah) info. Thanks for stopping by. I'm on my way to a Tibetan cooking class this morning! Oh, and I'll post today or tomorrow with info on my Menu for Hope prize. I can't say the idea to use tamales as a stuffing is unique to me. I first saw the concept as a stuffing for Cornish hens and after I created the recipe I saw it as a stuffing for a boneless turkey roll in the local newspaper. Neither was exactly like mine, but I just wanted to be sure everyone understood I wasn't taking credit for being the first one to think of it! My tamale stuffing goes inside a pumpkin. It makes a lovely vegetarian holiday main course or a great vegetable side dish this time of year. 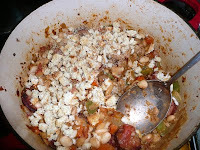 We enjoyed it with some vegetarian bulgur chili (watch for that post.) I used some of Primavera's wonderful gourmet tamales, but you could use any kind of cheese or, better yet, cheese and chile, tamale. Just add in some chopped vegetables of your choice to the initial saute. Truly a great way to celebrate a harvest festival! If needed (depending on tamales) -- salsa, chopped chiles, 1/4 cup corn kernels, 1/4 chopped zucchini or other ingredients to taste. Preheat oven to 425 degrees. Place pumpkin in roasting pan. Put milk inside pumpkin. Cook for about 20 minutes until pumpkin flesh is just starting to get soft. 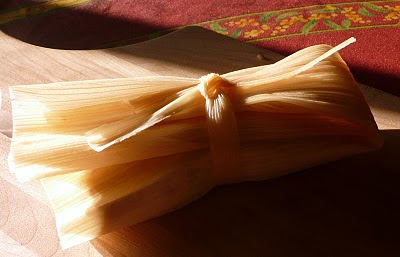 Steam tamales, unwrap from husks, set aside. Saute onion and garlic in oil until onion is browned. 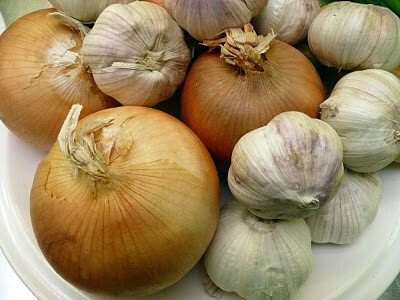 If using additional ingredients, add them to the onions and garlic and saute until softened. Crumble tamales into saute, breaking up and combining with other ingredients. Add salt and pepper as desired. Pack into pumpkin, stirring any milk remaining on the bottom into the mixture. Sprinkle paprika on top. Return to oven and bake another 45-60 minutes until the pumpkin flesh is soft and the stuffing heated through. When serving be sure to scoop out some of the pumpkin with the filling. 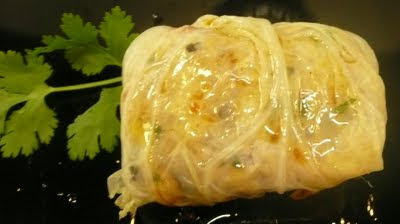 This is the second vegan cabbage roll recipe I developed for National Vegan Month. (For the Asian-inspired recipe and more on November being National Vegan Month, click here.) 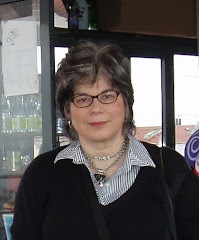 Since I was writing this for a Jewish audience (the Temple Beth Abraham Omer), I thought I would tweak a traditional Ashkenazi style stuffed cabbage taste profile. It is still filling, still hearty, and still a great main course or perhaps an accompaniment to some Chanukah potato latkes. The kasha (buckwheat groats) in the filling gives these cabbage rolls their hearty taste; a bit of ginger and a sweet and sour tomato sauce give them a lively, bright taste. I always found prepping the cabbage leaves for stuffing a bit intimidating. Some recipes have you whacking out the cabbage core and/or submerging and boiling a whole cabbage. I’ve developed a fairly fuss free way to prep the cabbage leaves that makes it relatively easy to prepare them for the stuffing (see recipe directions below). Give it a try. First prep the cabbage leaves. Score the bottom of the cabbage all the way around stem with a knife to detach the leaves from the stem. Pull off 10 of the outer leaves, making additional cuts at the stem if needed. Place the leaves in boiling water in a large pot. (You may want to prepare a few additional leaves in case of rips and tears or if you have some leftover stuffing.) Make sure the leaves are submerged. Cover and simmer for four to five minutes or until tender and pliable. Drain and let cool. Preheat oven to 350 degrees. In a large frying or sauté pan, heat the oil over medium high heat. Add onion and sauté 1 minute, add garlic, ginger, ¼ tsp. of black pepper and red pepper flakes. Sauté for a minute. Add carrots, sauté for 3 minutes, then add the mushrooms. Sauté for 1 minute and add the kasha, stirring well. Add the stock, bring to a low simmer. Cover and lower heat, simmering until the stock is absorbed and the kasha is cooked through (about 8 to 10 minutes), stirring occasionally. Taste and add more black pepper if needed and ¼ tsp. of salt or as needed. Mix in ½ cup of chopped tomato and ¼ cup parsley. In a small sauce pan over medium low heat, mix the tomato sauce, ground ginger, ¼ tsp. salt and ¼ tsp. of ground pepper, sugar and remaining tomatoes. Cook, stirring frequently, until the tomatoes have begun to soften. Take off the heat. Add the vinegar. Stir well and taste. Adjust by adding more sugar or vinegar as needed and more salt and pepper as desired. Ladle a thin layer of the sauce on the bottom of a 9x12-inch baking pan. Spread a cabbage leaf on a cutting board. Cut off hard end of stem. Place ¼ cup of filling in the middle of the leaf. Fold over the two shorter sides of the leaf. Fold over one of the longer sides, then the other. Place folded side down in the baking pan. Repeat with other leaves. Spread sauce evenly over top of cabbage rolls. Bake until the sauce is bubbling and the rolls are cooked through, approximately 45-50 minutes. Garnish with parsley before serving. 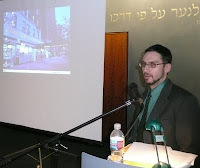 Over at the j weekly, I've had an article on the wonderful photo exhibit at the BJE Community Library in San Francisco on Balkan Sephardic Jews. Called "Images of a Lost World" it documents the lives of a population killed during WWII or dispersed afterwards. 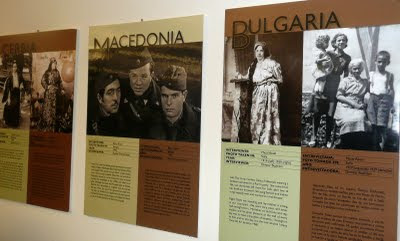 The photos and accompanying interviews document these communities in Bulgaria, Greece, Bosnia, Turkey and more. You can read my article here. The exhibit continues on display through the end of January. Many of the folks who were interviewed mentioned the food their mothers and grandmothers had cooked, but without naming any specific dishes. I started to think about the Greek and Turkish influences on the cuisine in that part of the world and developed this recipe in response to the exhibit. Lemon-Egg Sauce Moussaka with Lamb is lovely to eat, with rich, bright flavors, but only so-so to look at. So make this in your prettiest casserole dish and garnish with some chopped parsley and maybe a handful of fresh diced tomatoes on top to doll it up. Once you taste it, I think you'll agree, looks aren't everything. (Plus the leftovers were great, even cold.) There is no milk or cream in this moussaka, so it might work well for lactose-intolerant guests. The finished casserole may look a bit homey, but the taste is decadent and complex. The dish’s citrusy zing works well with the richness of the sauce and lamb, both of which help mellow the assertiveness of the eggplant. Use the full cup of juice for a stronger lemon flavor. Try serving with rice or potatoes to soak up the creamy (but definitely not dairy) sauce. Preheat oven to 400 degrees. Grease a large baking tray and place eggplant slices in single layer (use two trays if necessary). Brush tops of slices with a light coating of olive oil. Bake for about 30-40 minutes, turning and brushing tops with additional oil occasionally until the eggplant slices are soft throughout and golden brown. Set aside. Over medium high heat, heat 2 Tbs. of oil and sauté onion until beginning to turn golden. Add garlic, sauté until the onions are beginning to brown. Add lamb, stirring to break up meat. Sauté until the outside of the lamb is just browned. (Drain if desired, discarding fat). Add tomatoes, tomato paste, salt, pepper and oregano. Sauté until lamb is cooked through and tomatoes have begun to soften. Taste and correct seasoning. Add lemon zest, mix well. Set aside. Preheat (or turn oven down to) 350 degrees. Grease an 8 to 9” round casserole. Cover the bottom with half of the baked eggplant slices. Layer with half of the lamb filling. Pour half of the egg-lemon sauce over the lamb. Repeat. Sprinkle top with paprika. Bake uncovered for 50 to 55 minutes or until top is browned and the sauce is set (it will still be a bit loose when served). Let sit for 10 to 20 minutes before garnishing with chopped parsley and serving. November 1st is traditionally the Day of the Dead in Mexican and other cultures. Here in Oakland it is celebrated with a street fair full of color, music and spectacle on International Blvd. It's also celebrated with lots of food. The area is filled with delicious Mexican and other Hispanic foods anyway, but there's also lots of street vendors out especially for the fair. For information on this year's Day of the Dead celebration Sunday, November 1, from 10 a.m. to 5 p.m. on International Blvd. between Fruitvale and 35th Ave. , click here. (One tip, take BART to the Fruitvale station and you are there). One of my favorite parts of the Day of the Dead fair in Oakland are the altars set up to honor deceased family members or mentors. They are always emotionally involving, touching and quite beautiful. I also like all the handicrafts and artwork. 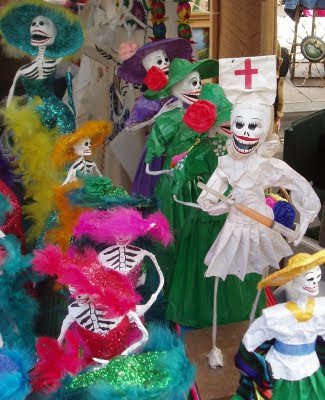 The skeletons above are oversized versions of traditional Day of the Dead figurines. Vote for your favorite -- candied (jellied) apple vs. caramel apple. 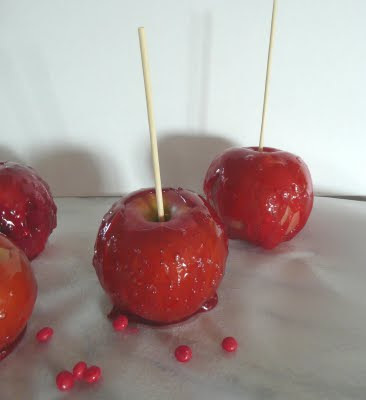 For a recipe for cinnamon candied apples, click here. 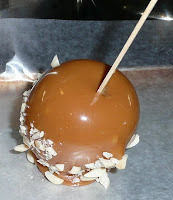 The caramel apple on the right was made from Kraft brand caramels with the recipe on the package. Here's the directions from the Kraft website (although I'd skip the Ritz cracker crumbs the on-line recipe recommends). 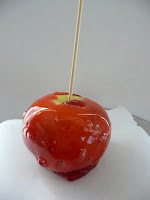 Take the poll (poll closes on 11/5/09) and leave a comment below about your favorite caramel and/or candied apple experiences, add ons, recipes or posts. UPDATE -- Poll is closed -- 42 readers voted (thank you! ), the winner at 78 percent was caramel apples. My favorite, candied apples, scored just 9 percent. Four percent liked both equally and 3 percent are not fans of either. 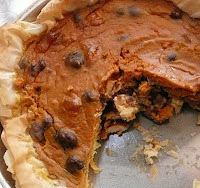 There are so many scrumptious things going on in a pumpkin pie that if you can trim the fat a bit no one will notice. Fill the unbaked crust with the pumpkin mixture and put into a preheated 425 degree oven for about 15 minutes and then lower the heat to 350 degrees . Bake for about 40-50 minutes until a knife inserted in the filling comes out clean. Another variation is to make a graham cracker crust, perhaps subbing out ginger snaps for the graham crackers. To make a cookie crust, please check the directions here. (Do not bake.) Only follow the directions for the crust otherwise you might surprise your guests with a S'More Pie instead of pumpkin. If you really want to keep calories down, try making the pie without a crust as a custard. 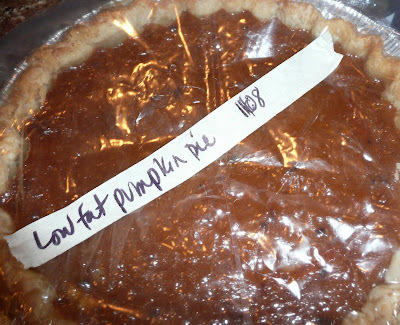 Directions for individual pumpkin pie custards are here. To see what other pumpkin tricks and treats Blog Appetit has to offer, please go here. About the photo: One of last year's pies all wrapped up for the freezer. The pies freeze well, so I often make a double batch and freeze one for later. Life intervened, so I wasn't able to post countdown goodies H-7 (Halloween minus 7) and H-6 so I'll do a three for one post today, H-5. 1. I like to celebrate Halloween with pumpkin-based main courses and/or desserts. Since I posted a dessert the other day (pumpkin date tart), I'll encourage you to check out this recipe for Moroccan Chicken Couscous with Chickpeas and Pumpkin. 2. Try this sweet and sour cabbage soup with winter squash. The recipe is written for butternut squash, but pumpkin works just as well. 3. Here's a guide on how to select and cook with pumpkins. Think of it as a pumpkin boot camp. It has links to other pumpkin based posts and recipes on Blog Appetit as well. About the photo: A u-pick pumpkin patch in Bolinas, CA, in October 2008. 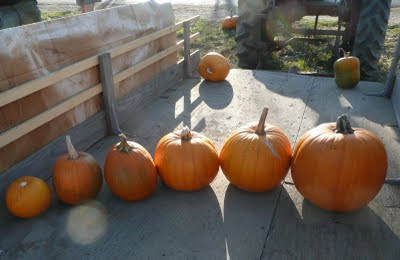 Each pumpkin on the back of the trailer is representative of a size and is marked with the price. Not your typical pumpkin pie (and probably a lot fewer calories, too). 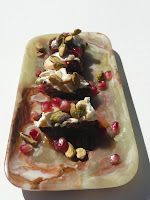 The tart reflects its Middle Eastern inspiration with its spicing and use of dates and nuts. It is rich and full tasting with a true pumpkin flavor. First make the pumpkin filling. In a large bowl combine the pumpkin puree, the eggs, juice, sugars, cinnamon and ginger. Mix well. Add the dates and walnuts and stir until evenly dispersed through filling. Set aside. Make the filo crust. Have ready a package of defrosted filo leaves. Set seven aside covered with a damp paper towel. Repackage and refreeze remainder of package. Brush the bottom and sides of a 9” round cake pan with vegetable oil. Take out one filo sheet (leaving others covered). Center in the cake pan and brush surface with oil. Take out another sheet, rotate it so the overhanging edges are offset with the first sheet. Brush with the oil. Repeat with four of the remaining sheets. Shred the seventh sheet and scatter across the bottom of the crust. Fill the crust with the pumpkin mixture. Fold the overhanging edges of the filo back over themselves and tuck into the tart. They should cover the edge of the cake pan and create a bit of an edge. Brush exposed filo with oil. Place in center rack in center of oven. Bake for 5 to 10 minutes or until exposed filo crust has turned golden brown. Cover exposed crust with strips of aluminum foil. Bake tart for about 50 minutes more or until center is set and a knife inserted in the center comes out almost clean. Remove foil strips and let cool to room temperature before serving. Want to make a pumpkin pie like your mom probably made, check out Cooking for Engineers post here for step-by-step instructions. For something more adventurous, try this pumpkin pie with hazelnuts, freshly ground spices and coconut milk from 101 Cookbooks. Heidi also gives an easy "pat in the pan" graham crust option. BANG. The sudden, loud boom of a shotgun and resulting acrid smell of gunpowder startled the crowd. We looked up and a man, dressed all in black with a long black coat and wide-brimmed black hat commanded our attention. He looked smug even without twirling the waxed ends of his handlebar mustache. He lowered his gun. He knew he had our attention. As the smoke cleared, Sheriff Virgil Earp informed the fanny-pack and flip-flop wearing tourists packed into rows of bleachers that for their own safety they were not to step beyond the paved walkway once the shootout at the OK Corral commenced. Earlier, as I had walked the wooden sidewalks of Tombstone Arizona, gawking at the costumed shopkeepers and stagecoach drivers, the smell of grilling buffalo burgers focused my attention almost as suddenly and sharply as the sound of Earp’s weapon would later that day. I resisted their fast food allure at places such as Helldorado (home of a comedy gunfight and a silver-miner themed miniature golf course) and pretty much every other café this side of Toughnut Street. The smell of the grilled meat seemed to find me wherever I was in the town (which was equal parts private history museum and tourist trap). The scent was rich and inviting and reminiscent of campfires and cookouts. I was hungry and finally gave into temptation and ordered a grilled buffalo burger from a little outdoor vendor tucked between two of Tombstone’s innumerable former brothels and saloons. As I waited the wafting smell conjured thoughts of cattle drives and chuck wagons as well as images of buffaloes home on the range (not to mention the thought of my patty grilling a few feet away from where I was sitting) and just made my burger lust stronger. Six minutes after I ordered I had a perfectly cooked, medium rare buffalo burger on a nondescript bun on a thin paper plate. The burger was so perfectly formed it looked suspiciously like the frozen beef patties that come stacked in plastic bags at the warehouse stores. The bun was airy and tasteless. I took a nibble of just a bit of the unadorned burger before I ladled the condiments on. The buffalo burger itself was juicy without being fatty. It tasted like beef but not like beef at the same time. A rich, meaty taste but different. Buffalo meat has been described as a little sweeter than beef and while I don’t know if that’s how I’d describe the difference, there is one. The taste and texture reminded me very much of grass-feed beef. I liked it very much. Soon I had piled on onions, tomatoes, jalapeños, ketchup and barbecue sauce. Less than six minutes later, my buffalo burger was extinct. On the drive back to our hotel in Tucson that day I already began to plan how I would make buffalo burgers when we got back to Oakland. Fresh meat, hand formed with maybe a secret ingredient or two on either a really good bun or on some thick sliced sourdough bread. 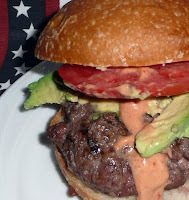 I’d serve the burgers with sliced tomatoes and some avocado wedges. One the side I’d have some of my oven-roasted potato fries. Once I got home and corralled myself some ground buffalo (which I found in packages at my supermarket's meat counter) that's just what I did. The Chipolte Adobo Sauce has a warm, smoky flavor that works well with the meat. I ended up drizzling it on my oven-roasted fries as well. Use it wherever you need a creamy, spicy sauce. Be sure to warn dinners they are not biting into a beef burger. The buffalo meat does taste different and expecting beef and getting buffalo could be an issue for some. Buffalo meat does well in the medium rare to medium range. I don't recommend grilling the burgers any rarer or more well done. Watch your timing, buffalo meat is said to cook quicker than beef. Also, you may want to experiment with different brands. Whether your buffalo meat was grass or grain fed will make a difference to the flavor and texture. Grass fed is generally leaner. First make the sauce. In a small bowl mix the adobo sauce, lime juice and mayonnaise. Stir well and set aside. Using your hands and being careful not to over handle, mix the meat with the salt, pepper and chili powder. Gently shape into three or four patties. Grill or broil until medium rare to medium throughout, turning occassionally. Let rest a few minutes and then put on buns slathered with the Chipolte Adobo Sauce and add garnishes of your choice. 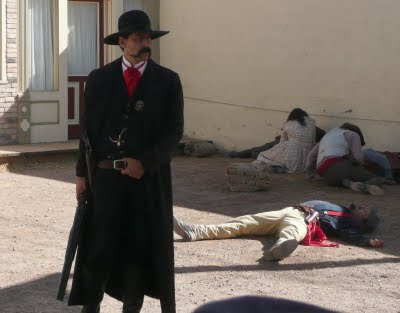 About the photo: That's Wyatt Earp after the shootout at the OK Corral in Tombstone, AZ. Doc Holiday, Morgan Earp and Virgil Earp had been wounded and exited stage left. The stage area is actually a few hundred feet away from the actual site of the corral, where life-size mechanical figures re-enact the shootout every few minutes. 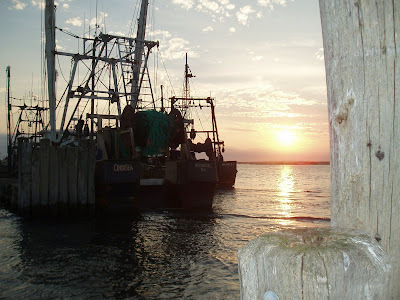 "No Submission," author of the new blog Adventures of a Tree-Hugging Vegan, is Blog Appetit's latest follower. It is a coincidence that this morning when I logged on I saw No Submission had elected to follow me since just last night I worked out some vegan variations on traditional Jewish foods for my j. weekly (local Jewish newsweekly) columns. Also, after the Hunger Challenge my husband and I decided to eat more meals "lower down the food chain." I'm not sure how that will translate to more vegan or even vegetarian recipes here, but I'm sure it will be reflected since generally what I cook you eventually see here on the blog. I also met some wonderful people at VegNews, a vegan-oriented publication, at the BlogHer Food conference and hope to work with them on getting more educated on this healthful eating option. The second confession is that I really don't have a photo of the recipe this post is featuring, a bean and vegetable tamale pie. While that really shouldn't matter, I've made a vow to try and avoid posts without photos. What could I do but do what newspapers and tabloids have done for years to get your attention -- throw in a little cheesecake. Or in this case little cheesecakes, since one of my favorite dessert offerings for potlucks, communal dinners, block parties, etc., are these cheesecake cups. 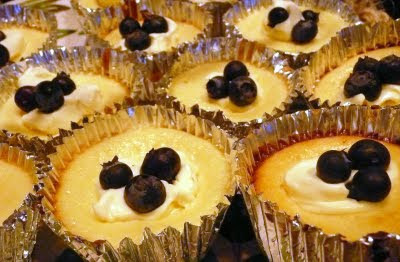 These little beauties have lemon flavoring and are topped with mascarpone cream and fresh blueberries. You can find instructions and variations for them here. The recipe below was featured in my column in the October issue of the Omer, the newsletter for Oakland's Temple Beth Abraham. It is a vegetarian tamale pie recipe that has evolved over the years and was inspired by a recipe in Moosewood Restaurant Low-Fat Favorites by the Moosewood Collective (Random House, 1996). 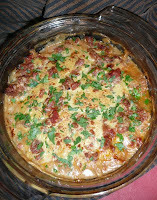 I first made the tamale casserole in 1999 for one of my sons’ religious school events. I have made it innumerable times over the years. My version makes a large “potluck” size, which means lots of leftovers if you are making it for a family dinner, or you can just cut quantities in half and bake in a smaller pan. Feel free to change out the vegetables, use pinto or kidney beans instead of black or leave out the cheese and/or avocado. Any way I’ve made it it’s always been delicious. First make the vegetable and bean mixture. Add the oil to a large, deep sauté pan or a wide saucepan. Over medium heat, add the onions sauté until beginning to turn brown and soften. Add garlic and sauté until lightly golden. Add chili powder and oregano and the carrots, stir well. Add a tablespoon or two of water or vegetable stock if the pan is dry and the carrots are sticking. Cover and let cook for five minutes or until the carrots have begun to soften. Remove cover. Add the bell peppers, zucchini, greens, corn and jalapeno. Sauté until greens and vegetables are almost cooked through. Mix in the tomatoes (with liquid), beans and cilantro. Stir well. Cover and simmer for 10 minutes. Taste. Add salt and pepper and more chili powder if needed. Set aside. Preheat oven to 400 degrees. Grease a large baking or lasagna pan or casserole dish. Evenly spread the vegetable mixture in the pan. Scatter avocado pieces on top and then layer the grated cheese. Set aside. My digression .... A bit on potluck -- the word is thought to derive from the English (first reference in 1592) concept of sharing food from the cooking pot with guests, although there are other etymologists who trace the word back to the Chinook word potlach, which was a Native American festival in the Pacific Northwest where hosts would redistribute their wealth, a practice that was later banned by the U.S. government at least until they began bailing out banks. In usage today potluck refers to a meal where all participants bring something to share. There are four separate categories of potluck contributors to my mind. Usually, but not exclusively, the second category is made up of single men who are told to bring such esoterica as chips, napkins or bread. This group includes bachelors as well as married men who are attending events without their wives. I've also seen some women end up in this category, so I'm trying not to be sexist. I'm not sure what happens if a men-only group organizes a potluck, but a women's only group tends to end up with a lot of salads, which brings us to the next category whose members are famous for the phrase "I thought I would bring something healthy." These potluck reformers can be counted on for the green salads, fruit salads, baby carrots and dips and similar offerings. (Of course, if they are presented with dressing, the healthy aspect does decline a bit.) Many potluck devotees (myself included) appreciate something starch-free and fiber-packed, others spurn these offerings for something with more cheese. The remaining category of participant is the cooking and/or time challenged who might bring in a pizza to the delight of any children in attendance. Category One types have been known to not so silently fume over the popularity of the purchased contribution. Others accept them without prejudice and with great equanimity. As long as the food tastes good, anyway. Around the blogosphere: Here's a recipe that would work well for a potluck -- Chinese Chicken Salad from Jaden of Steamy Kitchen. This is a fabulous salad that would qualify for both category one and three potluck participants. 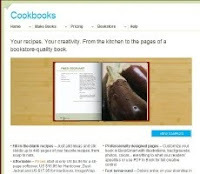 Elise of Simply Recipes has lots of recipes that work well for potluck. Try pretty much anything in her casserole category.